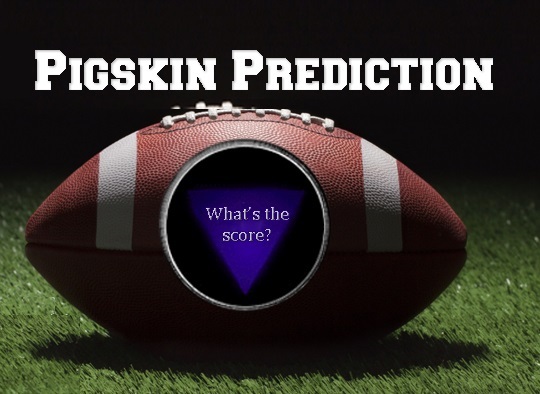 IT WAS A TOUGH WEEK FOR THE FAVORITES IN THE KVSH PIGSKIN PREDICTION CONTEST AS THERE WERE SEVERAL UPSETS. THIS WEEKS AVERAGE WAS MISSING HALF OF THE GAMES…..ONE PERSON MISSED JUST TWO GAMES FOR FIRST PLACE….RYAN GASS OF OMAHA TOOK TOP HONORS….JUST A HANDFUL MISSED THREE GAMES WITH NEBRASKA’S 565 YARDS DETERMINING SECOND PLACE….THAT HONOR GOES TO ELAINE NOVOTNY OF ELYRIA, NEBRASKA. WINNERS WERE MISSISSIPPI STATE…..HOUSTON….. DUKE…. OKLAHOMA…. GEORGIA….. EAST CAROLINA…. IOWA…. CLEMSON…. MISSOURI…. STANFORD…. ARIZONA STATE AND COLORADO.